A tram is a rail vehicle which runs on tramway tracks along public urban streets; some include segments of segregated right-of-way. The lines or networks operated by tramcars are called tramways. Historically the term electric street railways was also used in the United States. In the United States, the term tram has sometimes been used for rubber-tyred trackless trains, which are not related to the other vehicles covered in this article. London Trams, previously Tramlink and Croydon Tramlink, is a light rail tram system serving Croydon and surrounding areas in South London, England. It began operation in 2000, the first tram system in London since 1952. It is owned by London Trams, an arm of Transport for London (TfL), and operated by Tram Operations Ltd. a subsidiary of FirstGroup. New Addington is a terminal tram stop serving the centre of New Addington, in the London Borough of Croydon, in the southern suburbs of London. The tram stop is served by Tramlink, which connects New Addington with central Croydon. Sandilands tram stop is a light rail stop in the London Borough of Croydon in the southern suburbs of London. It serves the residential area along Addiscombe Road to the east of the centre of the town of Croydon. The accident took place in the dark and during heavy rain at 06:07,  on a sharp left curve approach­ing the points where the route from New Addington (on which the tram was operating) converges with the line from Beckenham Junction and Elmers End. The curve is located in a cutting, which comes almost immediately after the line emerges from a series of three tunnels on a 1-mile (1.6 km) straight section of track after leaving Lloyd Park tram stop. It has been described as a "sharp bend",  and has a 20 km/h (12 mph) speed restriction. The Bombardier CR4000 is a 76% low floor model of the Flexity Swift series of tram built by Bombardier Transportation and currently in use on Tramlink. They are based on and very similar in appearance to the K4000 built for use on the low-platform routes of the Cologne Stadtbahn network. Built between 1998 and 2000, the trams entered service in the spring of 2000. Bombardier Transportation is the rail equipment division of the Canadian firm Bombardier Inc. Bombardier Transportation is one of the world's largest companies in the rail vehicle and equipment manufacturing and servicing industry. Bombardier Transportation is headquartered in Berlin. There are many regional offices, production and development facilities worldwide. An articulated vehicle is a vehicle which has a permanent or semi-permanent pivot joint in its construction, allowing the vehicle to turn more sharply. There are many kinds of articulated vehicles, from heavy equipment to buses, trams and trains. Steam locomotives were sometimes articulated in that the driving wheels could pivot around. The Great Heck rail crash, also called the Selby rail crash, was a high-speed train accident that occurred at Great Heck near Selby, North Yorkshire, England on the morning of 28 February 2001. An InterCity 225 passenger train operated by GNER travelling from Newcastle to London collided with a Land Rover Defender which had crashed down a motorway embankment onto the railway line; it was subsequently derailed into the path of an oncoming freight train at an estimated closing speed of 142 mph (229 km/h). Ten people died in the resultant collision, including the drivers of both trains involved, and 82 others suffered serious injuries. It remains the worst rail disaster of the 21st century in the United Kingdom. The interim report was released a week later on 16 November 2016. At the time of the accident it was dark and it was raining heavily. There was no evidence of any track defects, or obstructions on the track, that could have contributed to the derailment. Initial investigation did not indicate any malfunction of the tram's braking system. Initial findings were that the tram, with about 60 people on board, was travelling at approximately 70 kilometres per hour (43 mph) at the time of the accident—far exceeding the speed restriction of 20 kilometres per hour (12 mph). The RAIB interim report noted that "a tram approaching the Sandilands Junction area from Lloyd Park at 80 kilometres per hour (50 mph) would need to brake at its full service rate of 1.3 m/s² for approximately 180 metres before the speed restriction board in order to be travelling at 20 km/h (12.5 mph) when the board was reached." The On Tram Data Recorder (OTDR) indicated that some braking had occurred within this distance but only sufficient to reduce the tram's speed from 80 kmph (50mph) to 70 kmph (43.5mph). 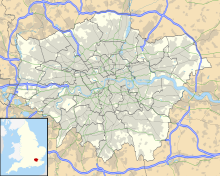 Wimbledon is a National Rail, London Underground, and Tramlink station located on Wimbledon Bridge, Wimbledon in London, and is the only London station that provides an interchange between main line rail, Underground, and Tramlink. The station serves as a junction for services from the Underground's District line and National Rail operators, as well as Tramlink services. Some early morning services on the Thameslink route are provided by Southern. The station is in Travelcard Zone 3. It is 7 miles 19 chains (11.6 km) from London Waterloo on the South Western main line. Epsom railway station serves the town of Epsom in Surrey, England. It is located off Waterloo Road and is less than two minutes' walk from the town's high street. It is 14 miles 18 chains (22.9 km) down the line from London Waterloo. The town of Morpeth in Northumberland, England has what is reputed to be the most severe curve of any main railway line in Britain. The track turns approximately 98° from a northwesterly to an easterly direction immediately west of Morpeth Station on an otherwise fast section of the East Coast Main Line railway. This was a major factor in three serious derailments between 1969 and 1994. The curve has a permanent speed restriction of 50 miles per hour (80 km/h). This led to the introduction of triangular speed warning boards with a yellow outline, sometimes referred to as Morpeth Boards, after this location, as well as these being accommodated with an AWS horn in the train driver's cabin to alert them of the warning. The Nuneaton rail crash occurred on 6 June 1975, on the West Coast Main Line just south of Nuneaton railway station in Warwickshire, England. The Amagasaki derailment was a fatal railway derailment which occurred on 25 April 2005 at 09:19 local time, just after the local rush hour. A seven-car commuter train came off the tracks on the JR West Fukuchiyama Line in Amagasaki, Hyogo prefecture, just before Amagasaki Station on its way for Dōshisha-mae via the JR Tōzai Line and the Gakkentoshi Line, and the front two carriages rammed into an apartment building. The first carriage slid into the first floor parking garage and as a result took days to remove, while the second slammed into the corner of the building, being crushed against it by the weight of the remaining carriages. Of the roughly 700 passengers on board at the time of the crash, 106 passengers, in addition to the driver, were killed and 562 others injured. Most passengers and bystanders have said that the train appeared to have been travelling too fast. The incident was Japan's most serious since the 1963 Tsurumi rail accident in which two passenger trains collided with a derailed freight train, killing 162 people. The Sutton Coldfield train crash took place at about 16:13 on 23 January 1955 in Sutton Coldfield, Warwickshire, when an express passenger train traveling from York to Bristol, derailed due to excessive speed on a sharp curve. The Grayrigg derailment was a fatal railway accident that occurred at approximately 20:15 GMT on 23 February 2007, just to the south of Grayrigg, Cumbria, in the North West England region of the United Kingdom. The accident investigation concluded that the derailment was caused by a faulty set of points on the Down Main running line, controlled from Lambrigg ground frame. The scheduled inspection on 18 February 2007 had not taken place and the faults had gone undetected. The 2008 Massachusetts train collision occurred on May 28, 2008, shortly before 6pm, when two westbound MBTA trains collided on the Green Line "D" Branch between Woodland and Waban stations, behind 56 Dorset Road in Newton, Massachusetts. An investigation by the National Transportation Safety Board (NTSB) originally found the cause of the accident to be due to the operator texting while driving, but the NTSB later found that the operator of the rear train, Terrese Edmonds, had not been using her cell phone at the time of the crash, but rather went into an episode of micro-sleep, causing her to lose awareness of her surroundings and miss potential hazards up ahead. The collision killed Edmonds, and numerous others were injured. Fourteen passengers were taken to area hospitals; one was airlifted. This crash, along with another similar accident a year later, led the NTSB to set higher standards and regulations regarding the use of cell phones while operating a train. The Cairns Tilt Train derailment occurred at 11:55 pm on 15 November 2004 when the City of Townsville diesel tilt train derailed north of Berajondo, approximately 342 km (213 mi) northwest of Brisbane, the state capital of Queensland, Australia. There have been two rail accidents at Carrbridge, Scotland. One occurred in 1914, and the second in 2010. 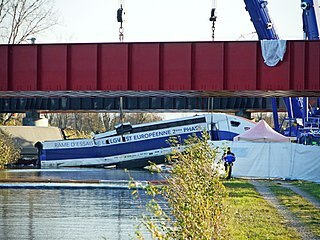 On 14 November 2015, a TGV train derailed in Eckwersheim, Alsace, France, while performing commissioning trials on the second phase of the LGV Est high-speed rail line, which was scheduled to open for commercial service five months later. The derailment resulted in 11 deaths among those aboard, while the 42 others aboard the train were injured. It was the first fatal derailment in the history of the TGV and the third derailment since the TGV entered commercial service in 1981. 1 2 3 "Several killed and more than 50 injured as tram overturns in Croydon". ITV. Retrieved 9 November 2016. 1 2 3 Ross, Alice; Gayle, Damien; Topham, Gwyn (10 November 2016). "Croydon tram crash: police examine reports of incident in previous week". The Guardian . Retrieved 11 November 2016. 1 2 3 4 "Overturning of a tram at Sandilands junction, Croydon 9 November 2016" (PDF). RAIB. Retrieved 7 December 2017. 1 2 3 "Investigation into a fatal accident involving a tram near Sandilands Junction, Croydon, 9 November 2016". Rail Accident Investigation Branch. 1 2 3 4 5 6 7 8 9 10 11 "Report IR1/2017 February 2017. Rail Accident Investigation: Interim Report 2. Fatal accident involving the derailment of a tram at Sandilands Junction, Croydon 9 November 2016" (PDF). Rail Accidents Investigation Branch. Retrieved 20 February 2017. 1 2 3 4 "Fatal accident involving the derailment of a tram at Sandilands Junction, Croydon – 9 November 2016" (PDF). Rail Accident Investigation Branch. 16 November 2016. Retrieved 16 November 2016. ↑ "BBC London Live: Latest updates". BBC London. 9 November 2016. Retrieved 9 November 2016. ↑ "Croydon Tram Derails: Several Feared Dead After Crash". LBC. 9 November 2016. Retrieved 9 November 2016. 1 2 3 4 "Croydon tram: Five dead and 50 injured after derailment". BBC London. 9 November 2016. Retrieved 9 November 2016. ↑ Tom Powell (9 November 2016). "Croydon tram derailment: Several feared dead and dozens injured after tram overturns at Sandilands". London Evening Standard . Retrieved 9 November 2016. 1 2 "BTP | Updated statement on tram derailment – Croydon". media.btp.police.uk. "British Transport Police". Archived from the original on 10 November 2016. Retrieved 9 November 2016. ↑ "Croydon tram crash: Who were the victims?". BBC News. 13 November 2016. Retrieved 14 November 2016. ↑ "Croydon tram crash: Driver held on suspicion on manslaughter". BBC News. Retrieved 10 November 2016. ↑ Horn, J. V. (1955). "Chapter VI. The tramways during the First World War". The Story of the Dover Corporation Tramways, 1897–1936. London: The Light Railway Transport League. 1 2 3 Davis, Barney; Watts, Matt; Sleigh, Sophia. "Croydon tram crash: first victim named as Crystal Palace fan, 19 who was on his way to work". London Evening Standard. Retrieved 10 November 2016. 1 2 3 "Croydon tram crash: Crane to lift carriages from site". BBC . Retrieved 11 November 2016. ↑ Clinnick, Richard; Browne, Stefanie; Stephen, Paul (23 November 2016). "Croydon tram speeding at 70kph on 20kph curve". Rail. Peterborough: Bauer Consumer Media (814): 6–7. ISSN 0953-4563. 1 2 "Croydon tram crash: Funeral costs offer from Transport for London". BBC News. Retrieved 16 November 2016. ↑ Gillett, Francesca. "Croydon tram crash: Giant crane arrives as work begins to move wreckage". London Evening Standard. Retrieved 11 November 2016. ↑ "Croydon tram crash: Carriages being removed from site". BBC News. Retrieved 12 November 2016. 1 2 "Croydon tram crash: Driver was 'three times over speed limit'". BBC News. Retrieved 16 November 2016. ↑ "Status Updates Tram". Transport for London. Retrieved 17 November 2016. 1 2 "Croydon tram line services resume". BBC News. Retrieved 18 November 2016. ↑ "Croydon tram crash victims 'ejected through windows'". BBC News Online. Retrieved 20 February 2016. ↑ "Croydon tram crash survivor's life 'now a nightmare'". BBC News Online. 15 March 2017. Retrieved 24 April 2017. ↑ Booth, Samantha (30 August 2017). "The timetable for Croydon trams is to change because of lower speed limits after fatal crash". Croydon Advertiser. Local World. Retrieved 31 August 2017. 1 2 "Croydon tram bosses install infra-red beams to shine on drivers' faces to check they are awake - drivers to strike in protest". Evening Standard. 1 November 2017. Retrieved 8 November 2017. ↑ "ORR organises Croydon tram safety summit". Office of Rail and Road. 19 January 2018. Retrieved 22 January 2018. ↑ "London trams to get automatic braking system". BBC News Online. Retrieved 14 January 2019. 1 2 "Croydon tram driver bailed as first victim is named". Sky News. Retrieved 10 November 2016. ↑ Morley, Nicole. "Crowdfunding page launched for victims of Croydon tram crash that killed 7". Metro . Retrieved 9 November 2016. ↑ Siddique, Haroon; Gayle, Damien; Rawlinson, Kevin (9 November 2016). "Croydon tram driver 'blacked out' in crash that killed seven, claim passengers". The Guardian . Retrieved 10 November 2016. ↑ Kolirin, Lianne (14 November 2016). "Tram drivers left 'in a daze' by erratic shifts". The Times (72067). p. 17. ISSN 0140-0460. ↑ "Croydon tram driver suspended after video of man 'asleep' at controls". The Guardian . 19 November 2016. Retrieved 20 November 2016. ↑ "Probe into driver 'falling asleep'". London Evening Standard . 18 November 2016. Retrieved 20 November 2016. ↑ "Croydon line tram driver suspended over Sun footage". BBC News. 19 November 2016. Retrieved 20 November 2016. 1 2 Thomas, Ed; Titheradge, Noel. "Croydon tram crash: Drivers 'fell asleep' on fatal line". BBC News Online. Retrieved 24 April 2017. ↑ "Dozens injured after tram overturns in Croydon". Sky News. 9 November 2016. Retrieved 9 November 2016. 1 2 3 Matthews, Tom (8 December 2017). "Croydon tram crash: The key things we've learned from the RAIB report into the causes of the disaster". Croydon Advertiser. Local World. Retrieved 9 December 2017. ↑ "There will be disruption 'for days' on Croydon trams after crash". Croydon Advertiser. 9 November 2016. Retrieved 12 November 2016. 1 2 Harris, Nigel (23 November 2016). "Croydon, HS2 and NR costs...". Rail. Peterborough: Bauer Consumer Media (814): 3. ISSN 0953-4563. ↑ "Croydon tram crash: Bosses were warned of 'speeding trams'". BBC News. 14 November 2016. ↑ Gwyn Topham (16 November 2016). "Croydon tram going three times speed limit when it derailed, say investigators". The Guardian. Retrieved 16 November 2016. ↑ "Fatal tram accident in Croydon". Rail Accident Investigation Branch. 3 August 2017. Retrieved 4 August 2017. ↑ "Fatal tram accident in Croydon". Rail Accident Investigation Branch. 25 September 2017. Retrieved 27 September 2017. ↑ "Croydon tram crash: Report says driver 'probably dozed off'". BBC News. 7 December 2017. ↑ "Updating of RAIB report 18/2017, Sandilands junction". Rail Accident Investigations Branch. 24 October 2018. Retrieved 26 October 2018. ↑ Wordsworth, Nigel (14 January 2019). "New automatic braking system for London Trams". Rail Engineer. Retrieved 27 January 2019.